Wolverine, Ghost Rider and Brass take on Deathwatch‘s goons in the hopes of rescuing Brigitte (Brass’s sister) and Jack (Ghost Rider’s friend). In London, Shanna discovers that some hippos and rhinos have been killed solely for their ivory – and, she has a feeling that she knows who did it. All the original members of the Fantastic Four are reunited in this issue. Using their powers together, they’re able to free the Exile from the web of energy he was trapped within. Lockjaw helps a local policeman rescue some homeless people from a burning building. 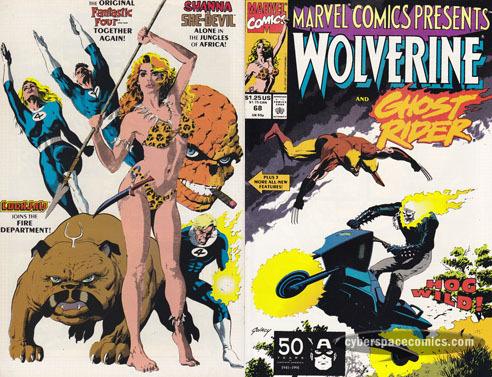 The Wolverine/Ghost Rider feature seemed like a waste of eight pages … and the Lockjaw story fell flat, too. The Fantastic Four concluded this issue but it was quite anti-climactic. Although, it should be noted that reuniting the original team was kind of a special event since, at this point, the Fantastic Four series was devoid of Mr. Fantastic and the Invisible Woman (they had temporarily retired). Finally, it’s nice to see Shanna get a little limelight. With art by Paul Gulacy, it’s sure to look good so I’m just hoping that Jones has a good story cooked up. Charles S. Novinskie served as Topps Comics’ sales and promotions manager. He’s written articles for Comics Interview and Star Wars Galaxy Magazine. Novinskie was also the editor on Overstreet’s Fan magazine and Topps’ Duckman series. 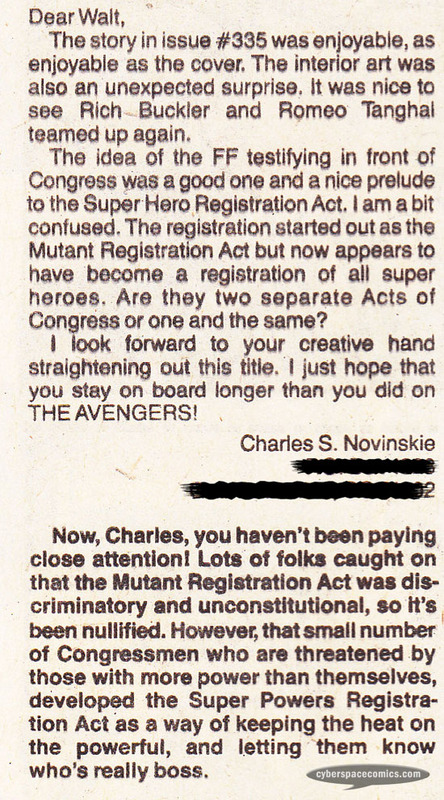 He got a letter printed in Fantastic Four #339 (cover date – April 1990), inquiring about the Super Hero Registration Act (a plot point that Mark Millar reused in Marvel’s Civil War). Sergio Aragones‘ art style is instantly recognizable – usually by his character designs and incredibly detailed visuals. 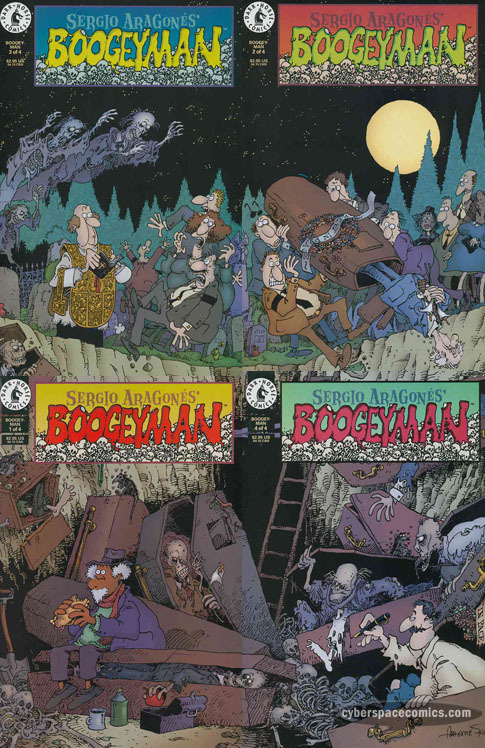 All four covers for his Boogeyman series combine into one image. 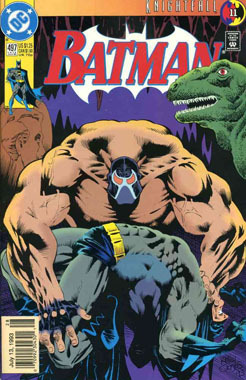 Batman #497 is a modern age book that’s become quite iconic – it’s the crux of the Knightfall storyline wherein Bane breaks Batman‘s back. Morbius – Doctor Michael Morbius was a Nobel Prize-winning biochemist who suffered from a rare blood disease. He devised and experimental treatment to cure the ailment and tested it on himself. The treatment went wrong and Morbius now needs to feast on blood in order to survive. He also developed super powers from his experiment including flight, speed, and super-strength. 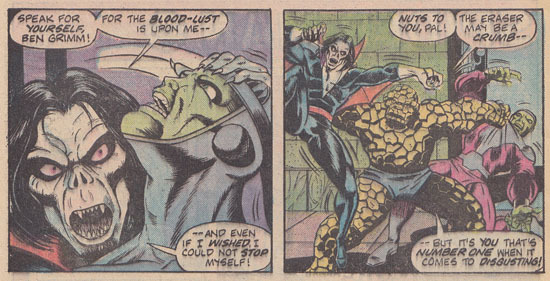 Morbius breaks into Alicia Masters‘ apartment, intending to make her his next meal but, his attack is quickly stopped by a visit from her boyfriend, the Thing. As they battle in her apartment, in the alleyway below, the Living Eraser makes his return to Earth. He intends to create havoc here in order to convince the military from his home, Dimension Z, that control should be taken from their Supremor and given to him. 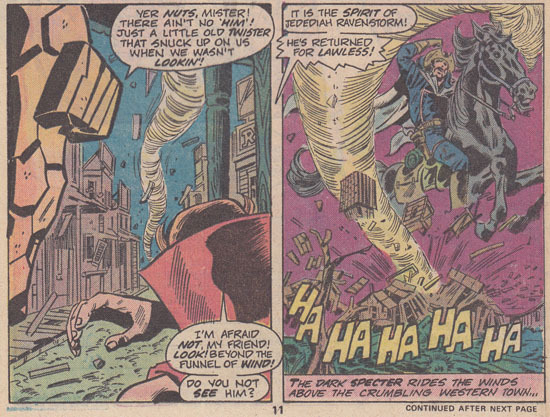 As Morbius is driven out of Alicia’s apartment, he flies through the alley below and spies the Living Eraser – his next target! The Thing sees the attack and suspects that Morbius is just attempting to feast on another unfortunate human – not suspecting that Morbius’ victim is a malevolent invader from Dimension Z. 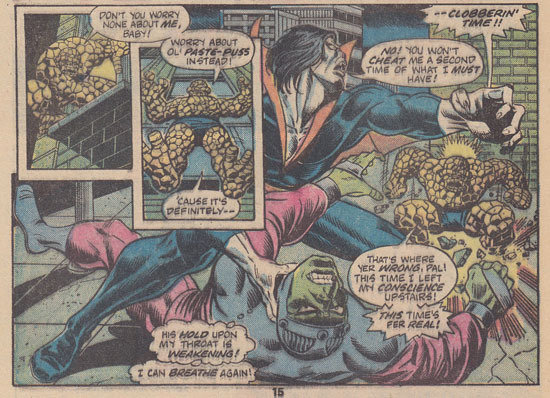 And, as the Thing and Morbius do battle for a second time, the Living Eraser turns his erasers on both of them – transporting them to a prison cell in Dimension Z. 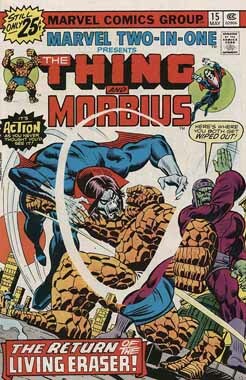 The Thing and Morbius decide to set aside their differences and work together to get back to Earth and stop the Living Eraser’s rampage. They break free from the cell, fight through the Eraser’s forces, locate some erasing devices and use them to return to Earth. Once there, they make quick work of the Living Eraser. But, rather than bask in is victory, Morbius turns the erasers on himself in a bid to save the Earth from being inhabited by the monster he considers himself to be. That battle against the Living Eraser takes place in Midtown Manhattan – but in between, the Thing and Morbius are dispatched to Dimension Z. In Sensational She-Hulk #35, it’s revealed that the first Living Eraser was executed! That very same issue introduces a new Living Eraser. WHY is Morbius the guest-lead? I fight it rather interesting that Morbius (originally a Spider-Man villain) later went on to feature in his own solo series. He took over Fear with issue #20 (cover date: February 1974) and was featured there until the series ended with issue #31 (cover date: December 1975). 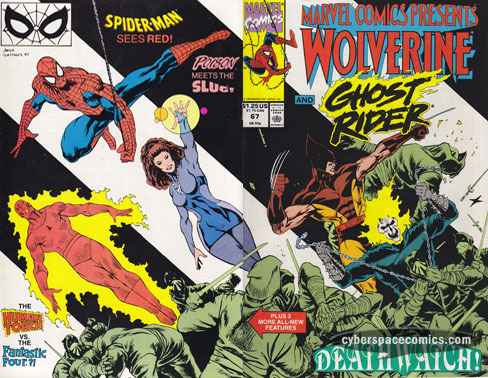 The last three of those issues were written by Bill Mantlo – who wrote this very issue! So, it seems that Mantlo enjoyed writing the character (he also used the character in Marvel Premiere #28 [cover date: February 1976]). If you’re curious to find out what happened next to Morbius, check out Spectacular Spider-Man #7-8. To be honest, there was far too much coincidence in this book for me to really enjoy it. Morbius attacking the Thing’s girlfriend? OK. I can accept that – but once the Living Eraser just happens to transport himself into that very same location … at the very same time – well, now you’ve lost me. There was also quite a blooper that I just couldn’t help but notice. 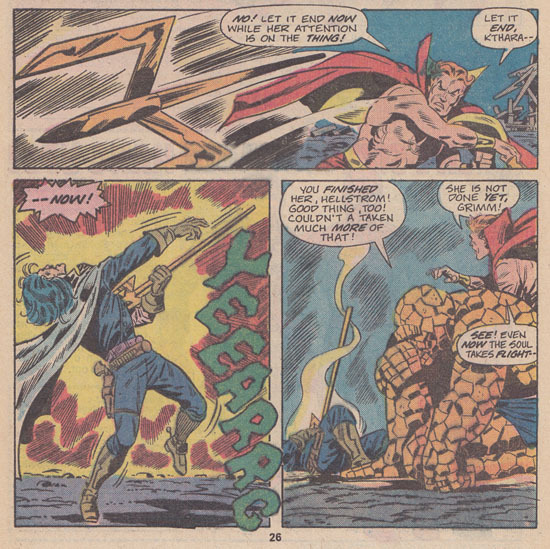 On page 26, the Thing turns the eraser on the Living Eraser – erasing his right arm. The arm is still missing on page 27 but somehow, it magically reappears on pages 28 & 29. Similarly, the Eraser erases the Thing’s left leg on page 26. It’s missing on page 27 but it magically reappears on pages 28 & 29. On the plus side, it’s nice to see the Thing knock Morbius around and then form a tentative alliance only because they absolutely need to rely on each other to free themselves from Dimension Z. Note: This issue’s letters column features commentary on Marvel Two-In-One #13 and includes letters written by Paul Dini and Ralph Macchio. Additionally, this comic includes Marvel Value Stamp [Series B] #79 (part of the Silver Surfer puzzle). Yuji explains to Wolverine that Deathwatch is after his son, Sean, as well as Logan, himself. In this issue, Deathwatch’s men capture Yuji’s daughter, Brigitte, in order to lure Sean Watanabe (who goes by the codename Brass) and Wolverine into their clutches. They’ve also kidnapped Jack D’auria – a friend of Dan Ketch (aka Ghost Rider). Imbued with the power of Mrinhä, Joe Trinity launches an assault on Dallas in the Slug’s home. But, before he loses total control to the powerful entity, Poison steps in to stop him. Her power tempts Mrinhä into leaving Joe’s body in the hopes of possessing hers – but she is able to finally defeat the mysterious force. The Human Torch arrives at the Baxter Building and is attacked by the Mad Thinker’s FF androids. Meanwhile, the Thing learns that the green alien that appeared last issue calls itself the Exile. It is trapped within a web of “opposite” energy that could explode if it makes contact with the alien. The Exile reveals that the events of the past few days were arranged by him to test these super-powered beings to ensure that they had the ability to rescue him. A firefighter named Jerry steps into Roxie’s Diner and notices the latest Daily Bugle headline. True to form, it implicates Spider-Man may have been responsible for a building being burnt. But, Jerry was there – so he knows the truth. He then recounts the events of how he and Spider-Man stopped Blowtorch, the highest paid arsonist on the East Coast. So, we finally get some insight into what Deathwatch is after, in this issue. The Poison solo ended without providing any insight into the mysterious force named Mrinhä. It seems like there’s more to be discovered about the Exile from the Fantastic Four story and the Spider-Man tale was kind of fun but nothing deep. Charles S. Novinskie served as Topps Comics’ sales and promotions manager. He’s written articles for Comics Interview and Star Wars Galaxy Magazine. Novinskie was also the editor on Overstreet’s Fan magazine and Topps’ Duckman series. He got a letter printed in Fantastic Four #320 (cover date – November 1988). When Acclaim relaunched many of Valiant’s titles, they debuted a mini-series starring the villain, Master Darque. All four Leonardo Manco covers combine into one image. 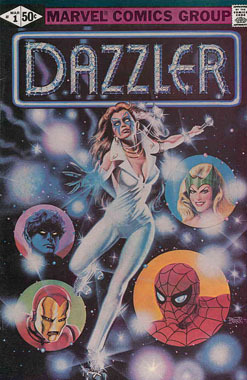 Attempting to capitalize on the disco craze, Marvel debuted Dazzler in the pages of the Uncanny X-Men #130 (cover date: February 1980). She was a disco singer that could convert sound into light blasts. She also had a groovy unitard costume and roller skates. No, seriously. Anywho, she got her own series a year later – the first issue sported a fancy painted cover. Flash forward a couple decades. 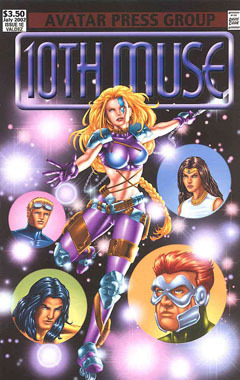 10th Muse debuted in 2000 – she’s the modern day daughter of the Greek god, Zeus. Her first series launched from Image Comics and showcased photo variant covers with Rena Mero dressed as the title character. 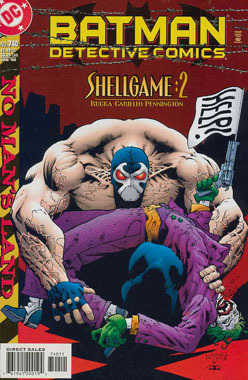 When the series relaunched under Avatar Press, it debuted with several variant covers that were cover swipes. Son of Satan – At the time this was published, it was believed that Daimon Hellstrom was the son of Satan. It’s since been retconned that he’s the son of a motal woman and the demon, Marduk Kurios. He’s been trained in the way of magic but his sympathies lie with humanity and he works to rid Earth of dark forces. Oftentimes he harnesses the mystical energy through his trident into a blast he calls “soulfire”. Reed Richards sends the Thing to a ghost town in Arizona to explore some strange readings his psych-detector picked up. He enters the town’s Lone Star Saloon and encounters a creepy painting of a man on a horse. Strangely enough, the bar isn’t deserted like the rest of the town – Daimon Hellstrom is there! He explains to Ben Grimm that he’s been drawn to the town to investigate the very same source that Reed detected. The force seems to center on the painting and Hellstrom explains that the man pictured in it is Jedediah Ravenstorm. More than 100 year prior, Ravenstorm was a lawless criminal moving from town to town, stealing from his victims. He crossed the Colorado Dessert and started his own town – calling it Lawless. The town eventually filled with people … people who grew tired of taking orders from the outlaw. They hung him on New Year’s Eve in 1875 (that’s 100 year prior to the very date of this story) and one year later the town was deserted. As Hellstrom’s narrative draws to a close, a whirlwind comes whipping through the town, led by the spirit of Jedediah Ravenstorm! The outlaw wants the strangers out of his town but Hellstrom intends to end his possession of the town’s soul. The Thing joins Daimon in his battle against Ravenstorm – but it sure is hard to defeat a spirit. Or is it? During the fight, Hellstrom deduces that they’re not just fighting Ravenstorm’s spirit but rather Kthara, Mother of Demons – she’s inhabited his ghost. She intended to possess the soul of Daimon for, if she could do that, she assumes she could take his father’s, as well. But, when she relinquishes control of Ravenstorm’s spirit after being struck by Hellstrom, she unwittingly unleashes the souls of the townspeople who turn on her to exact their revenge. The ghost town that the Thing is sent to explore is Lawless, Arizona. Neither Jedediah Ravenstorm nor Kthara have been seen since this issue. WHY is the Son of Satan the guest-lead? 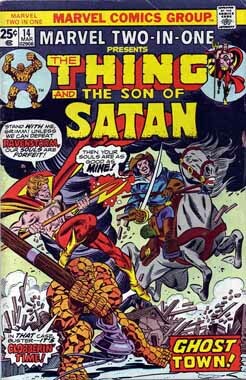 Daimon Hellstrom’s feature had recently been moved from Marvel Spotlight to his very own solo title in December 1975. Setting him up as the guest-star in this issue gave him some exposure that was surely intended to interest more readers to try out his own series. This issue was a neat ghost story that gave off some seriously creepy vibes – especially in the beginning. Not much characterization for the Thing but it served to wrap up the storyline of Daimon’s villain, Kthara. I really enjoyed how offput the Thing was by Hellstrom’s “area of expertise” – you can tell he’s really unnerved by it all and can’t wait to get away from the situation and put it all behind him. Note: This issue’s letters column features commentary on Marvel Two-In-One #12 and includes a letter written by Kurt Busiek. Additionally, this comic includes Marvel Value Stamp [Series B] #45 (part of the Doctor Strange puzzle).